Review of 'Tomb of the Cybermen': Is it worth the money? Doctor Who fans around the world were thrilled last winter by the news that the long-lost episode "Tomb of the Cybermen" had been found  in Hong Kong! CBS-Fox Video, the BBC's American distributor, will release this classic episode in the United States on October 10  along with several other interesting Doctor Who tapes. Starring Patrick Troughton as the Second Doctor, "Tomb of the Cybermen" is a superior example of an early, black-and-white Doctor Who story, though not quite deserving its classic reputation. "Tomb" marked the third Dr. Who story to feature the Cybermen. Introduced in the 1966 episode "The Tenth Planet," the Cybermen were at first lumbering, cloth-swathed villains, inhabitants of a planetary twin to Earth. Long ago these creatures had been like us; but through eons of replacing their failing organs with electromechanical "cyber" analogs, they had become alien, without emotion, and unable to reproduce. They possessed only the need to dominate and to make others like themselves. In foiling their dastardly plot to conquer Earth, the Doctor so exhausted himself that he triggered a "regeneration" (allowing Patrick Troughton to take over the role of the Doctor from departing actor William Hartnell). Having created a newly popular set of baddies, the BBC producers wasted no time in bringing back the Cybermen. Troughton (as the second Doctor) faced them in his fourth full story, "The Moonbase," which aired in March 1967. But instead of lumbering, cloth-swathed villains, this time the Cybermen were lumbering, metal-clad villains. Despite such changes, the Doctor still managed to defeat them. The following September, the BBC premiered the fifth season of Doctor Who with "Tomb of the Cybermen." Doctor Who has always had a substantial affection for its own mythology. More than once, the producers have attempted to create a sense the Doctor Who is more than just a series. Although implemented haphazardly, the cumulative effect of their efforts over 26 years os stories has yielded a "universal history"  a timeline binding together diverse events over the entire existence of time. "Tomb of the Cybermen" is part of that mythos. Set centuries after the Cybermen have disappeared from human history, "Tomb" opens in an isolated valley on a desolate planet. An archaeological expedition is seeking the fabled final resting place of the former enemies of mankind, the Cybermen. In this era, the Cybermen are beings of legend, larger than life (both in metaphor and actuality). What follows, unfortunately, is a stock adventure. Once the expedition leaves the expanses of the barren valley and breaks into the Cybermen's mountain crypt, the story becomes limited and claustrophobic. The characters are figures of cliche: the upright leader, the mad scientist, the enigmatic and evil Arab, her gigantic, almost speechless black servant, the dashing American pilot ... you've seen them in a dozen B movies. Only the Doctor and companions (Jamie and Victoria) are novel additions ... along with the Cybermen. Tall, ruthless and clever, the Cybermen have an insatiable drive to conquer. They are emotionless. They have no strengths beyond their physicality, no natural allies, no call on our pity, nothing to stand for but their own needs and will. In the end, they defeat themselves. Unfortunately, Gerry Davis died on August 31, 1991, before hearing of the rediscovery of his work. The release of "Tomb of the Cybermen" is a fitting tribute to his memory. 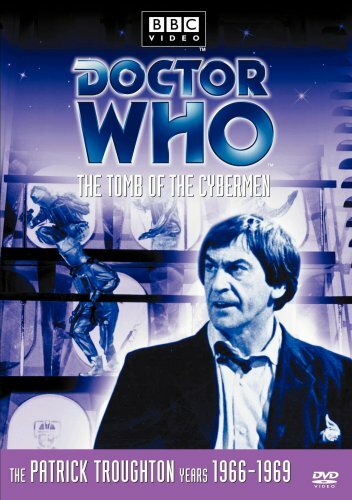 Review of "Tomb of the Cybermen" : Is it worth the money? I enjoyed "Tomb of the Cybermen" for its archival value, for its contribution to the Cybermyth and for Patrick Troughton's performance. But it is not a classic "Who" episode, not compared to "The Mind Robber" or "The Invasion." The philosophy presented in "Tomb of the Cybermen" is standard Doctor Who fare: the mad scientist hoist on his own petard. It is rather sexist in parts, especially the way the American pilot treats Victoria (the Doctor's companion). The episode's claustrophobic atmosphere is probably due to budget constraints. This is a constant problem with Doctor Who, and one most fans will gladly forgive. But I still wish for more scenes like the evocative opening. A more serious problem is with the Cybermen themselves. Fans who have seen only later episodes will find these early Cybermen almost impossible to understand. Fans should not expect to see a perfect episode. However, they will doscover in the "lost" episode a most enjoyable show. A few points for video collectors unsure whether to invest in "Tomb of the Cybermen." It is oneof only six complete surviving Patrick Troughton episodes. It is also the only full episode with companion Victoria Waterfield; all her others are lost. Finally, "Tomb of the Cybermen" is an important part of "Doctor Who" history, making a powerful contribution to the Cybermyth. Plus, "Tomb" contains the famous scene (much repeated in later episodes) of the Cybermen breaking out of their frozen catacombs. CBS-Fox Video is also releasing "Shada," [available in VHS] the never-complete episode scripted by Douglas Adams (author of the Hitchhiker's Guide to the Galaxy book). This episode of the fourth Doctor was to have completed Season 17 back in 1979-80, but a BBC strike halted production. For Cybermen fans, another "lost" episode, "The Invasion," [availabe in VHS] is due out in Britain next February. Parts one and four of this eight-part episode are missing, but BBC Video plans to have veteran "Who" actor Nicholas Courtney (Brigadier Lethbridge-Stewart) narrate the missing action. Additional "Who" tapes being released in October are "The Caves of Andrazoni," the final episode of Peter davison as the Fifth Doctor; and "The Pertwee Years," [available in VHS] a compilation of episodes of the Third Doctor.